On February 11th at Cherico’s Martial Arts, the Pittsburgh Brazilian Jiu-Jitsu community came together in force for a day full of rolling, drilling, learning, eating, and fun, all in support of Tap Cancer Out! Nine participants actively fundraised, together raising a combined $6,113. Sharee O’Neil was our top fundraiser with $1,230 raised and Pride Lands BJJ was our top fundraising team with $2,904 raised! For her victory Sharee not only took home all the perks for surpassing the $600 milestone (free entry, exclusive Under Armour fundraiser t-shirt, and rashguard/hoodie) but also snagged a free Tap Cancer Out x Inverted Gear Gi. 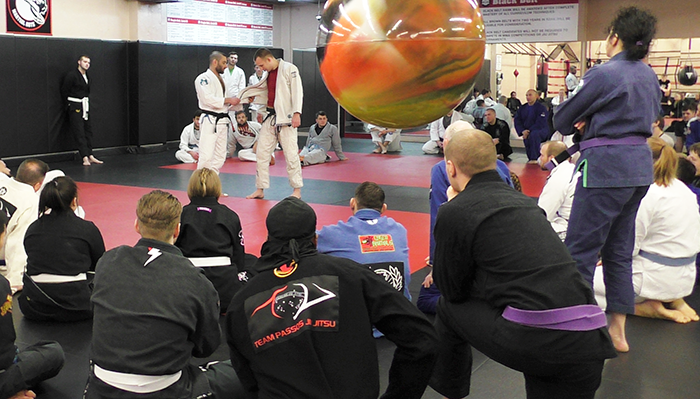 Dozens of attendees represented many of the Pittsburgh area’s BJJ schools. A thank you goes out to the black and brown belts who hosted mini-seminars throughout the day, and a special thanks to our volunteer host Michael Graham (who also fundraised $769 on his own) for his hard work putting on this event! We’re really looking forward to seeing this become a yearly event in Pittsburgh. If you’re interested in hosting your own Grapplethon to support Tap Cancer Out, head to our Grapplethon homepage to learn more.